As a North American traveler, you might not think Korean Air’s SKYPASS is the best frequent flyer program for you, but you might be surprised. Korean Air is one of the founding members of the SkyTeam alliance, and partners with Delta, Air France and KLM, among others. Unlike most members of the alliance, though, it offers access to first-class award space. 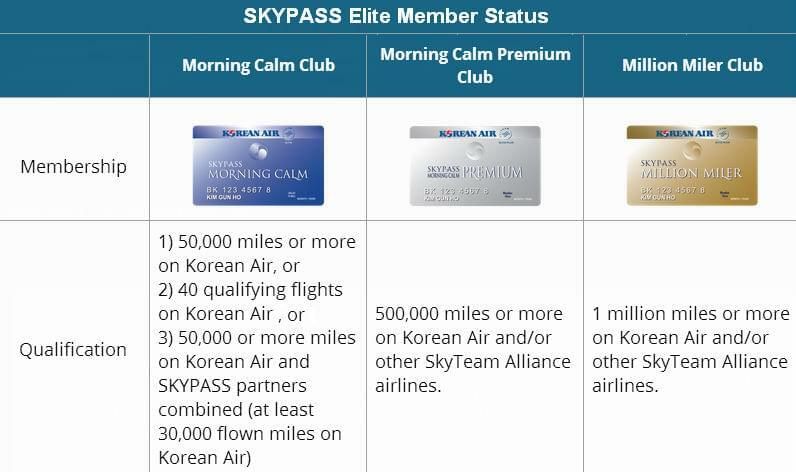 Many SkyTeam member airlines reserve this exclusively for their own program members, but Korean Air SKYPASS gives you access not only to this cabin, but frequently has two to four first-class award seats on each flight. For an Asian airline, Korean Air has also made it extremely easy to earn miles from the U.S. They have partnered with U.S. Bank for five co-branded credit cards in addition to being the only SkyTeam member of the Chase Ultimate Rewards program. That means with Chases quintuple category earning on cards like the Chase Freedom and Chase Ink, you can rack up a first-class Korean Air ticket surprisingly quickly. Plus, if you want to fly to Asia, Korean Air flies to more U.S. destinations, including less-frequent gateways like Honolulu, Las Vegas and Seattle, than any other Asian airline. How Can You Use Korean Air SKYPASS Miles? 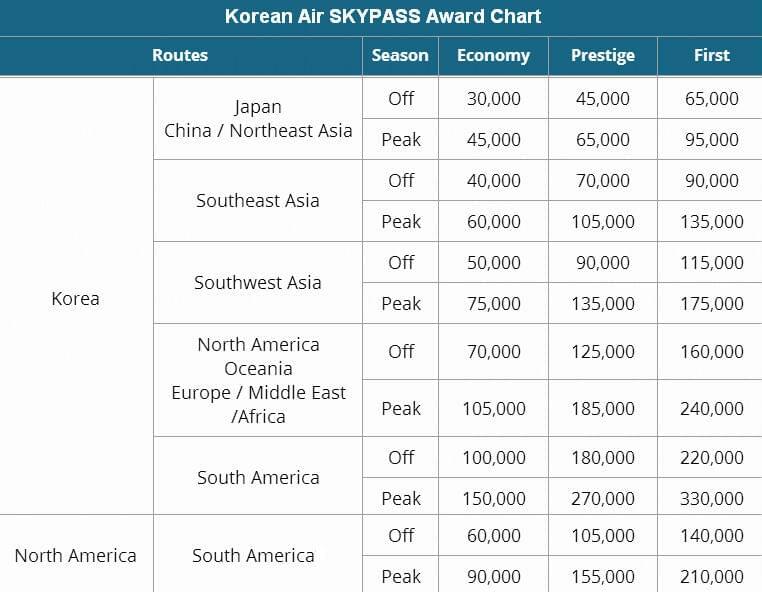 Korean Air has one award chart for its own flights, which are broken into peak and off-peak pricing. It uses some unusual names for its classes, with Prestige replacing business and Kosmo often replacing first. The previous award chart was somewhat confusing, and charged more if you were flying on a new business- or first-class seat, such as the Prestige Sleeper, First Kosmo Sleeper or Kosmo Suite. SKYPASS award charts for SkyTeam partner flights are broken up by region, so you have different award charts for flights departing from different areas. In April 2014, Korean Air simplified its award chart, while slipping in some cleverly hidden devaluations. To see certain prices for travel from the U.S., you need to actually look at the region you are traveling to and see the number of miles required to fly to the U.S. from there. Perhaps one of the coolest ways to use Korean Air miles, however, is to redeem them directly for other types of travel, from lounge access to rental cars to airport transfers to hotels. While with many airlines the award chart sweet spots are found using one airline to fly a partner, Korean Air gives great rates to fly its own wonderful first-class suite from one of its more than a dozen U.S. destinations, with first-class seats for 80,000 miles one way. You can fly both Korean Air and its partner airlines for very good or at least competitive prices to many places across the Pacific, but redemption rates to Southwest Asia and the South Pacific are high. 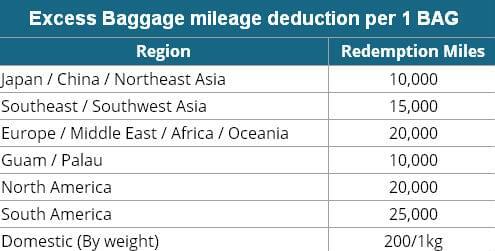 Korean Air doesn’t partner with any carriers from Oceania, New Zealand and Australia, and its significantly higher award prices for these areas (up to 110,000 in economy and 240,000 in first class roundtrip) reflect this lack of coverage. Tickets purchased at a discounted rate of 50 percent or more in G, D, I, H, E, L, K, Q, T and V classes are not eligible for upgrades, which can only move from one class to the next highest class. Awards typically require a bit more miles than the difference between one class and the next on the award chart. For instance, an economy award ticket between Korea and Japan costs 30,000 miles roundtrip, and a Prestige award costs 45,000 miles. An upgrade between the two costs 20,000 miles. The best sign-up bonus available with these cards comes with the Visa Signature Card, which typically offers 15,000 miles after the first purchase, and occasionally goes as high as 30,000. The card also comes with 2,000 bonus miles on renewal and two lounge passes each year.